Gifts can range from superhero socks to a journal to time with family and friends. In the forward.com article “8 days of meaningful Hanukkah giving,” Shanee Markovitz writes, “it’s not about what we give as much as why we are giving it.” She offers night-by-night suggestions based on different themes. Night 1 (Jewish values and roots): gifts like Chanukah Mad Libs for kids or a gift card to a Judaica store for adults. Night 2 (self-care): for kids, tablets that change the colour of bath water; for adults, essential oils for the bath or a massage. Night 3 (dream big): for all ages, a journal or a pillow and/or pillowcase. Night 4 (family and friends): again, for all ages, a picture frame for photos of/with family and friends. Night 5 (hope): for kids, a night-night projector; for adults, scented candles. Night 7 (surround yourself with warmth): for kids and adults, a sweater. 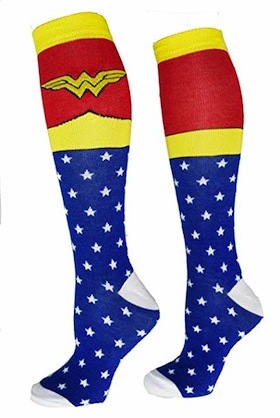 Night 8 (resilience): superhero socks for the kids and, for the adults, a goal planner or household tool kit (Maccabees means “Hammer,” after all). Rabbi Rona Shapiro writes on ritualwell.org, in the article called “Chanukah gifts,” about using theme nights in an effort to practise moderation. Her family has had Big Gift Night (when each child gets one big gift from their parents); Grandparent Night (gifts from the grandparents); Book Night; Music Night (a night of songs); Cooking Night (make latkes and enjoy them with friends); Tzedakah Night (wrap presents to deliver to a children’s hospital or other charity); and Homemade Gift Night (such as a family photo album or scrapbook). For adults, she suggests presents ranging from personal blessings to wine, food and candles.